Mr. 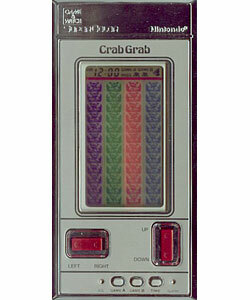 Grab must clear the Demon Crabs from the top row of the screen, but when he pushes them off the top of the screen, they reappear at the bottom and attack. There are four columns of Demon Crabs. Move Mr. Grab and push the Demon Crabs off the top of the screen. When you do, they reappear on the bottom and may attack, so move out of their way. Once the top row is cleared of Demon Crabs then the display is cleared and you score 10 points. A timer counts down as you play, and if you don't clear the crabs fast enough then they become more aggressive. If Mr. Grab is attacked by a Demon Crab then you get a miss. Three misses and the game ends. If the timer reaches 0, four more crabs will appear from the bottom of the screen. The timer counts down twice as fast as in Game A. When it reaches 0, the Crabs increase in speed.